Pleasant weather at end of Chol HaMoed sees picnicking, hiking nationwide. Hundreds of thousands of Israelis once again flocked to Israel's parks and beaches on Wednesday, celebrating the last full day of Chol HaMoed Pesach (the Intermediate Days of Passover) before the Chag begins again Thursday. The main tourist sites Wednesday were the Caesarea National Park, the Eshkol National Park, Ein Gedi, the Einot Tzukim nature preserve, the Ashkelon National Park, the Einot Tzukim Nature Preserve, Beit Guvrin National Park, and Me'erat HaNetifim Nature Preserve. 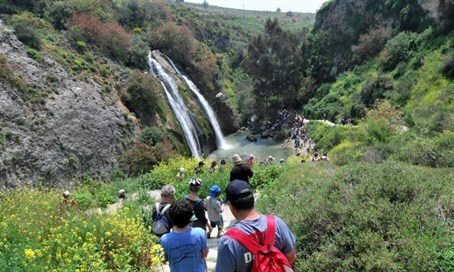 Crowds were also spotted at several water spots, including Mejarsa, Nahal Iyoun Nature Preserve, Tel Dan Nature Preserve, Hermon Nature Preserve (Banias), and Horeshet Tal National Park, despite the lower temperatures. Several major tourist attractions were closed due to overcrowding, including the Ramat Gan Safari, the Sataf spring in Jerusalem, and the parking lot for Ganei HaYeshua park in north Tel Aviv. Ein Kobi in the Jerusalem area was closed entirely Wednesday due to a sewage backup after days of crowding. The Keren Kayemet LeYisrael (KKL) reported large crowds at forests nationwide Wednesday, including Emek HaMaayanot, Emek Hatechelet, Biria Forest, Goren Park, the Gilboa Forests, Moredet HaCarmel forest, Ben Shemen Forest, Hakedoshim Forest, the Jerusalem Hills forests, Brittania Park, Ilanot Forest, Edulim Park, Ramot Menashe Forest, Melachim Forest, Be'eri Forest, Lahav and Devira Forests, and the Swedish Forest.